So to celebrate that whiskers & lions has been online for more than 2 years now, I have a little surprise for you today. It's taken me some time, but I worked on it over Christmas and finally managed to finish it: my London guide! During my three years in London I made it my mission to find all the best hotspots in the city. From where to find the best brunch to where to get the most beautiful flowers. Click on the map to go to the Google map! If you're living in London, you'll probably know about most of these places. However if you're visiting London, you'll probably want to make the most of your time here so that's why I've selected some my favourite restaurants, bars and shops and put them on a map for you! I haven't marked the obvious must-visits like all the great museums, department stores, markets, parks and landmarks; you can find those in any guide. 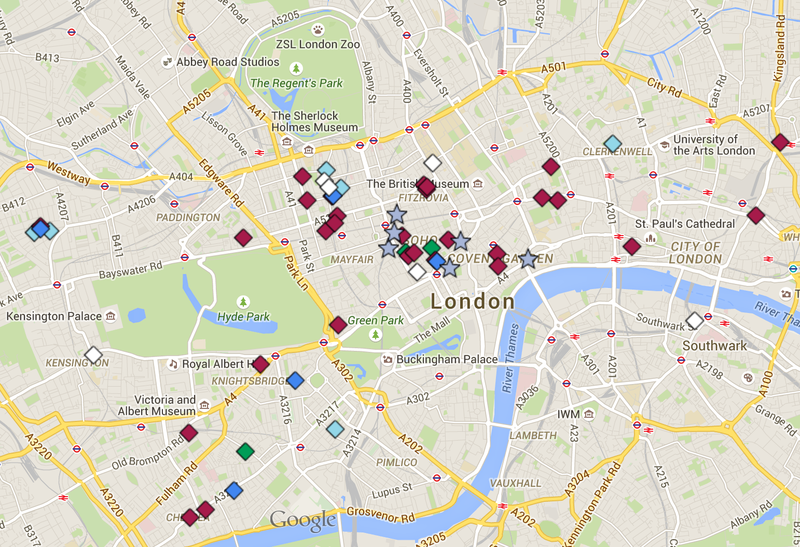 This is more of an insiders food and drinks guide to London. In terms of restaurants, I only pinned the ones I wrote a review about, so the ones I went to but didn't review, didn't make it to the map. That way, you can my full review, see pictures, and decide if it's a place you'd like. Of course, I'll be adding on all new places I review so this will be a map you'll always be able to use when you're in London. ps. this idea was totally inspired by Liza Chloe's Paris Guide. This guide is really great and I used it when I went to Paris, so make sure to check that out as well!